There's a magical place where bottles of all shapes and sizes are filled with deeply colored liquids and line dusty shelves. 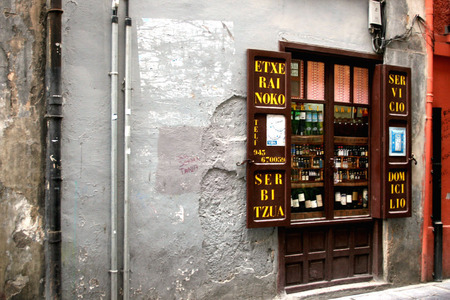 It's dark and cramped in Otegi Ardoak, a tiny shop in Tolosa, a medium-sized town in Basque Country. An air of mystery pervades the atmosphere. Plastic gallon-sized jugs line the cabinet on which the cash register rests, filled with anise extract, sherry for cooking, port, all homemade by the owners of the shop. It's a digestif made with chamomile flowers, which the jovial shopkeepers invited us to smell. The aroma was deeply herbal and completely irresistible. In the end we walked away with several bottles. They were good-natured, urging us to speak to them in our limited basque, offering us mouthfuls of nísperos (a slightly prune-flavored fruit, in english called a medlar) and lecturing us on the proper uses of their goods. I asked them how they began making liqueurs, and the younger, fifty something owner said, "I don't know, I mean, we were just sitting around with nothing to do so we thought, why not?" Yes.